When the healing practice of Acupuncture (an ancient Chinese medical practice over 3000 years old) was introduced in Belize, many were skeptical about the results of this "new" practice. Carlos Villatoro has laid these fears to rest making his Acupuncture and Massage Center one of the most visited clinics in San Pedro. Today its healing qualities are being sought by many tourists and local alike. Carlos was born in El Salvador, Central America where he lived for four years and then moved to Guatemala City. There he attended elementary, high school and college majoring in Naturopathy. This knowledge led him to his interest in Acupuncture. Guatemala City didn't offer any courses in this subject, so he decided to travel to the U.S.A. to pursue his career. His first move was to California where he got his license in Massage Therapy at the Berkeley School of Massage, in Berkeley, California, one of the best schools at that time. He continued his studies in Santa Fe, New Mexico at Southwest College of Acupuncture where he studied Acupuncture and Chinese Medicine. From New Mexico he continued on to Texas. He worked at the Austin Wellness Center from 1981-84 in Austin, Texas; one of the first Holistic Health Centers in the area. "Being in the capital of Texas, we worked hard and lobbied to make the practice of massage professional. Finally in 1986, a law was passed and licensure was attainable for Massage Therapy. It was in Austin he met and practiced with noted Chinese Acupuncturist, Paul Lin, from 1984 -1987. "We saw over 40 persons per day. We ran around like rats from room to room. It was crazy, but people saw good results," laughed Carlos. Carlos was also a pioneer in Acupuncture. In Texas, Acupuncture faced a hard uphill battle for 14 years attempting to get legal work approved by the state legislature. Carlos was finally awarded a license to practice Acupuncture by the Texas State Board of Medical Examiners in1994. He was also one of the first to work with medical doctors and thus pioneered Acupuncture into the medical field. In 1988, he moved to Houston, Texas and eventually worked and trained in Physical Therapy at the Athletic Rehabilitation Center directed by David King, Licensed Physical Therapist. In 1990 he joined a prominent Neurologist, Randolph W. Evans, M.D., in the Houston Medical Center providing Acupuncture and Physical Therapy treatment until1997. "I saw a lot of injuries and trauma resulting from on the job injuries, automobile accidents and other neurological disorders including people suffering from chronic back, neck pain, migraines and other headaches," Carlos stated. During this time he explained and demonstrated Acupuncture to medical students from the University of Texas at Houston and third year family practice residents from Baylor College of Medicine who were on a monthly rotation training under Dr. Evans. Carlos is also the author of the book, Taoist Movements, which is a practical manual of Chinese exercises. 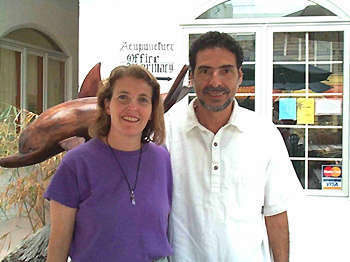 Carlos met his future wife, Vicki in 1984 in Austin, Texas. Vicki Evans is an art teacher, artist, author and educational consultant. She graduated from the University of Texas at Austin in 1978. She has teaching certificates in art education and elementary education. She has taught art for over ten years in public and private schools. She has also presented workshops for teachers at the Houston Independent School District, the Texas Art Education Association Annual Conferences, and Parent/Child Creative Imaginary Workshop for the Children's Museum of Houston. Her workshops are based on concepts from an art game and children's book she has published, The Color Box and Be Like the Sun and Shine. In her workshops she utilizes guided imagery and art to teach specific reading and writing objectives, enhances higher level thinking skills and encourages cooperative learning and problem solving. She was also a group leader for Rice University's Center for Education School Writing Project and a facilitator for Rice University's Reforming Schools Summer Institute. In San Pedro, Vicki teaches art part-time at The Island Academy. She is creating a lot of artwork inspired by living on the island. Locally she has been selling some of her prints. "The island is a wonderful, inspirational environment to live in. It's amazing how many artists and writers have moved to the island besides the local talent that is already here. There seems to be an ëArtistic Renaissance' happening here for the new millennium. It's very exciting to be part of it." Together they have one son Kevin, who is presently eleven years old. Vicki's son, Tony, is 20 years old and attends the University of Texas at Austin. On a family vacation, they first visited San Pedro in 1988 and decided someday they would live on the island. Their dream became a reality when they arrived in San Pedro to live in late October of 1997. In 1998 the Acupuncture, Physical Therapy, Massage Center at Island Plaza in San Pedro Town was opened where Carlos currently practices. He offers over nine types of other services besides Acupuncture: Acupressure, Swedish Massage, Deep Tissue Massage, Reiki, Polarity and Craniosacral Therapy, Reflexology, and Chiropractic adjustments. He also gives holistic health consultations designed to improve people's health naturally. Carlos and his family love the San Pedro community and feel very comfortable and welcome here. Presently they are in the process of building their home in Ambergris Caye securing a day to day lifestyle in "La Isla Bonita", which they enjoy.